Chia seeds are gaining in popularity as a quick and healthy breakfast alternative to cereal. Like breakfast cereals, chia seeds are full of healthy nutrients like omega-three, fatty acids, fiber and protein, and taste much more interesting if you soak them in different plant based milks. Topping the seeds is limitless. Many people like to treat chia as if it was a yogurt replacement by adding granola and fresh fruit. 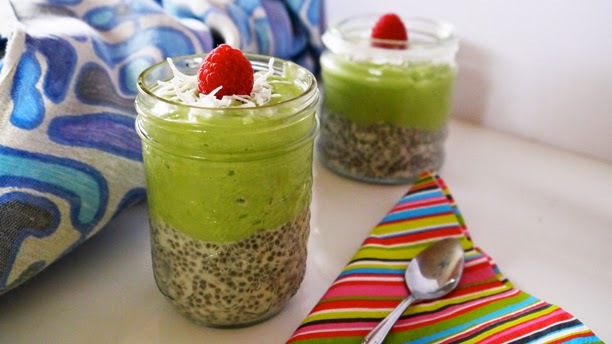 Smothering chia seeds in blended avocado is another option and goes very well with the coconut-infused seeds. Although coconut and avocado are fatty, they are both good fats and help remove cholesterol. They also help speed up your metabolism and give you an extra boost of energy, which is important in the morning! In a sealable container, mix chia seeds, coconut milk, coconut, vanilla and syrup. Stir together and allow to set over night, or at least four hours. The chia will expand and absorb the delicious coconut milk. In a blender combine avocado, coconut milk and syrup. When you wake up in the morning and you are really tired and don't have a lot of energy to make breakfast, scoop a few tablespoons of the chia pudding into a bowl and top with avocado topping. Sprinkle with extra coconut, fresh fruit or granola for extra flavour and crunch.